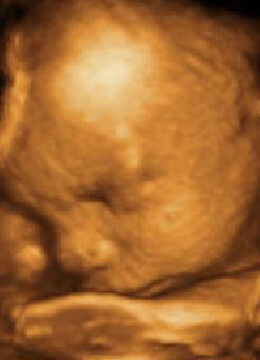 A main focus of our job is the pregnancy care, especially with the 3D and 4D ultrasound scan. Examinations like nuchal transluency measurement connected with an "early fine diagnosis" help you and us with observing the development of your unborn child even earlier, if you wish to. This will give you a feeling of safety and supports you with conciously enjoying your pregnancy. With the development of the computer technology, it is possible to depict tissue structures and surfaces threedimensional(3D). With the introduction of the time as fourth dimension, it is also possible to depict movement in real time as plastic (4D). In the pregnancy, abnormalities can be better detected with the 3D/4D technology. Beside that, it is a special experience for you, to see your child threedimensional in the womb and follow its movements. Other than the 2D depiction, the child can be seen clearly (4D animation). At the same time, the new ultrasound technique is as harmless as the previous ultrasound scan and possible throughout the whole pregnancy.